Generations of trust along with the tradition of quality and professional workmanship, has been recognized by our name for decades. 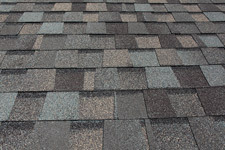 Fiberglass Reinforced Asphalt shingles features a dimensional appearance. A wide range of colors and depth enhance the desired look of real wood shakes with a Class â€œAâ€ fire rating with warranties that range between 25 to 50 years. Cedar shakes and shingles are built to withstand the elements and this time tested natural product will enhance the appearance of your home or building. Fire treated shakes and shingles provide excellent fire protection and meet the rigorous testing standards for Class â€œA, B or Câ€™ fire resistance and weathering as set by the Uniform Building Code and National Fire Protection Association. Warranties range from 25 to 50 years. 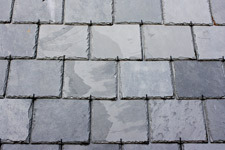 Slate Roofs are in a category by themselves. Â Dramatic and Elegant, slate roofs have been used for centuries to protect and beautify the more distinguished homes. Ranging in color from soft sea greens to brilliant reds few products can match its style and performance. Â With a true life expectancy of 100+yrs, good quality slate is obviously a once in a lifetime choice..
Tile Roofs have a variety of unique colors, styles and finishes. 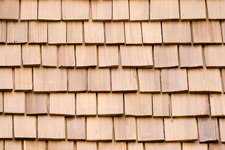 Tile can resemble the more traditional barreled style or be made to look a lot like wood shingles or slate. 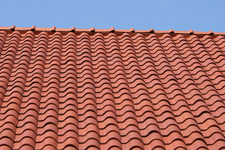 Clay or cement tiles can last a lifetime and can beautifully enhance the curb appeal of a home. Tile protects your home from fire, high winds and blistering heat and is environmentally friendly It is important to ensure the roof structure has been designed appropriately to handle the weight if this is your product of choice. Metal Roofs are becoming more and more popular. A metal roof can provide a wonderful accent over bay windows, dormers, and balconies. Metal is also a great way to produce the feeling of “Architectural authenticity.” Metal roofing costs are surprisingly affordable due to the fact that a metal roof is a permanent one; the life-cycle costs are substantially lower than conventional roofing materials. 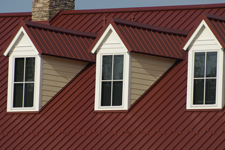 For aesthetics, metal roofing comes in a variety of styles and colors to fit your personal preference. At Ron Ruff Roofing, we install metal roofing, from copper to sheet metal to aluminum. We can help you choose the roof that adds the right look to your home. Built-Up Roofing or BUR Roofing consists of multiple layers of reinforcement plies that are adhered and surfaced with a variety of materials. 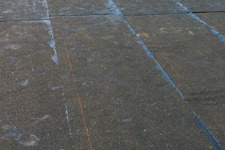 Generally are composed of alternating layers of bitumen and reinforcing fabrics that create a finished membrane Multi layered roof systems have passed the test of time and continue to be the most durable application available. Systems are designed to perform between 15 and 30 years with the ability to be restored to extend their useful life. Single ply roofing Membranes consist of EPDM (Ethylene Propylene Diene Monomer), TPO (Thermoplastic Polyolefin), and PVC (Polyvinyl Chloride) membranes delving excellent weather durability and long-term life. Single play roofing systems can be loose-laid and ballasted, adhered or mechanically attached to the substrate. With single ply roofing membranes, there are many choices to suit a variety of applications and needs. 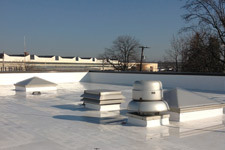 As part of a cool roof solution, our white TPO and PVC roofing membranes deliver high reflectivity and emissivity without an additional coating.